With just a single hour hand, the Veshelda less a watch than a reminder time is passing. First introduced in 2014, the Veshelda is inspired by one of Peter Speake-Marin‘s earliest watches, the Shimoda. Both are characterised by a single, elongated hour hand tells the time to the nearest five minutes. 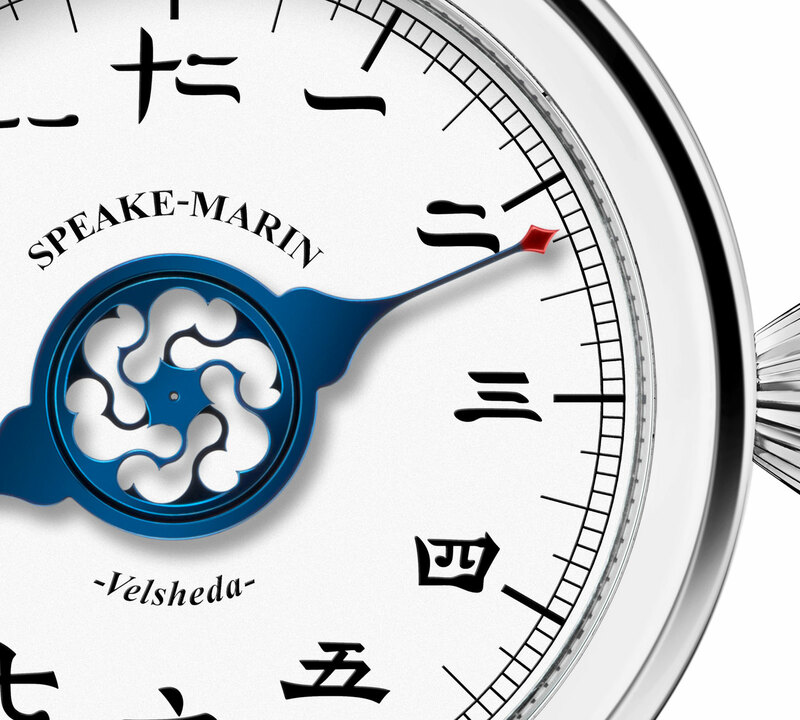 The Veshelda Chinese is the latest in a series of one-handed limited editions, including one containing a drop of the most expensive rum ever sold, with the usual Roman numerals replaced with Chinese characters. Specifically, the hour numerals are written in simplified Chinese characters, the standard form of written Chinese in mainland China, Singapore and Malaysia. Numbers aside the rest of the watch remains the same. 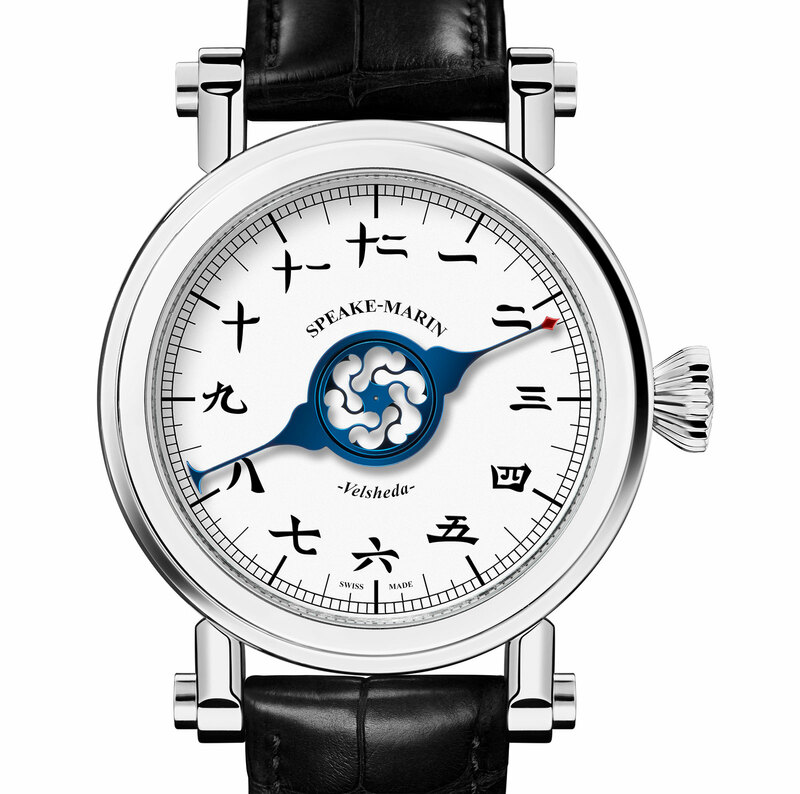 The dial is lacquer a glossy white, with the hands in blued steel. There are actually two hands superimposed over one another in the centre: the red-tipped hour hand on the outside, and a topping tool-shaped seconds wheel within. The case is titanium and 42mm in diameter, designed in the style typical of the Piccadilly, Speake-Marin’s signature watch case. It features a display back that reveals the calibre 3002 made by Vaucher, the sister company of Parmigiani respected for its well made movements, which also supplies movements to Richard Mille, Hermes, and more recently, Baume & Mercier. The Veshelda Chinese is a limited edition of ten watches, available only at Khronos, Speake-Marin’s retailer in Kuala Lumpur, Malaysia. It is priced at RM38,000, equivalent to US$9080.